This November 10 performance features Jonny Lee Miller as the creature. Childlike in his innocence but grotesque in form, Frankenstein’s bewildered creature is cast out into a hostile universe by his horror-struck maker. Meeting with cruelty wherever he goes, the friendless Creature, increasingly desperate and vengeful, determines to track down his creator and strike a terrifying deal. 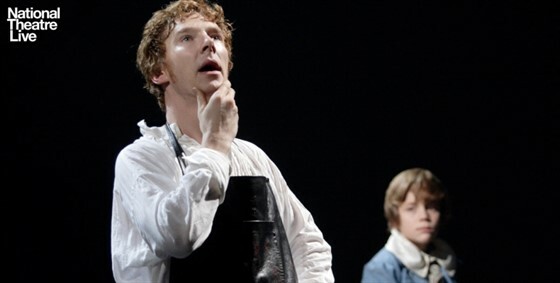 Danny Boyle’s National Theatre production of FRANKENSTEIN, a play by Nick Dear based on Mary Shelley’s novel, was filmed twice for NATIONAL THEATRE LIVE to allow cinemagoers to see Benedict Cumberbatch and Jonny Lee Miller alternating the roles of Victor Frankenstein and the Creature.